The Orton-Paragon Sentry Xpress 4.0 Digital Programmer. Before February 2019, Paragon used three programmers: a 3-key Sentry Xpress 4.0 or a 12-key Sentry 2.0 programmer developed by the Orton Ceramic Foundation and Paragon, or a Sentinel SmartTouch touch-screen programmer developed by Bartlett and Paragon. In February 2019, two of the programmers were modified, leading to the 3-key Sentry Xpress 5.0 and the 12-key Sentry 3.0 programmer. The modifications have little effect on the basic functionality so kilns might ship with the older programmers for some time. All three are made as ramp-hold, or cone-fire and ramp-hold. Your kiln will have the appropriate programmer although, if it has a Sentry Xpress ramp-hold, you can upgrade to a cone-fire and ramp-hold. If the case is large enough, you can upgrade from a Sentry Xpress 3-key to a Sentry 12-key or a Sentinel touch-screen. Generally, the programmers on bead annealing, enamelling, glass, jewellery, knife-making, and metal clay kilns have one firing mode: ramp-hold. And the programmers on ceramics, earthenware, porcelain, and stoneware kilns have two firing modes: cone-fire and ramp-hold. Unlike calculators, programmers aren't made 10 million at a time. Although they look like fairly simple circuit boards, they have embedded sophisticated pre-loaded software that has taken years to develop and refine. 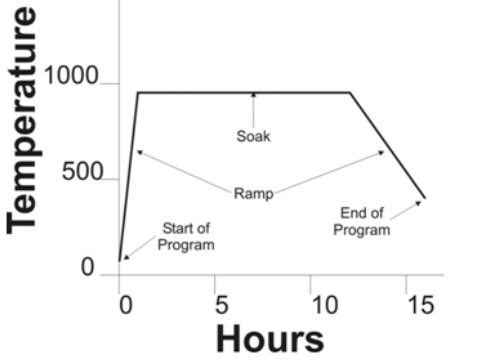 What Is A Ramp-Hold Programme? This video is about setting a ramp-hold programme on the Sentry Xpress 4.0, but there are two more videos about setting a cone-fire programme and using the advanced features. UK-EU programmers will be configured to show degrees Celsius. It's easy to use: far easier than a central heating programmer. Generally, you choose something with the left-hand key and use the other two to change the temperature or time up or down. You can set up, and re-use, four sequences of up to eight heating, holding, and cooling segments: and do something else whilst the sequence is running. Ramp-hold also allows you to programme slow heating and cooling: useful, for example, for annealing or controlling the colours of ceramic glazes. The programmer runs a programme that you have set, or one that is in its memory from a previous firing. It's a sequence of ramps and holds, for example: it heats to 800°C at full speed then holds for 30 minutes. The sequence then ends, the kiln beeps, and cools in it's own time. The ramp is the part where the temperature increases until it reaches the target temperature: the hold is the part where the temperature stays the same. A ramp segment of a sequence controls the rate of heating or cooling. For example, the kiln can heat up at 200°C per hour from 200°C to 800°C, which would take three hours. Or, the kiln can cool down at 100°C per hour from 600°C to 200°C, which would take four hours. The heating rate cannot exceed the rate at which the kiln would heat up if it was full on. The cooling rate cannot exceed the rate at which the kiln would cool if it was turned off. At full speed the elements are on all the time. During set ramps and holds they turn on and off repeatedly to maintain the heating rate, cooling rate, or temperature.